(Francisco Kjolseth | The Salt Lake Tribune) Heavy equipment crews work to clear Provo Canyon on Friday, Jan. 18, 2019, after an avalanche, which brought down as much as 30 feet of snow at mile marker 12 above Bridal Veil Falls on SR 189, was triggered by Utah Department of Transportation crews on Thursday. A side road next to Provo canyon was allowing cars through as they cleared the area knowns as Slide Canyon. (Francisco Kjolseth | The Salt Lake Tribune) Heavy equipment crews work to clear Provo Canyon on Friday, Jan. 18, 2019, after an avalanche, which brought down as much as 30 feet of snow at mile marker 12 above Bridal Veil Falls on SR 189, was triggered by Utah Department of Transportation crews on Thursday. A side road next to Provo canyon was allowing cars through as they cleared the area knowns as Slide Canyon. (Francisco Kjolseth | The Salt Lake Tribune) Heavy equipment crews work to clear Provo Canyon on Friday, Jan. 18, 2019, after an avalanche, which brought down as much as 30 feet of snow at mile marker 12 above Bridal Veil Falls on SR 189, was triggered by Utah Department of Transportation crews on Thursday. A side road next to Provo canyon was allowing cars through as they cleared the area knowns as Slide Canyon. (Francisco Kjolseth | The Salt Lake Tribune) Heavy equipment crews work to clear Provo Canyon on Friday, Jan. 18, 2019, after an avalanche, which brought down as much as 30 feet of snow at mile marker 12 above Bridal Veil Falls on SR 189, was triggered by Utah Department of Transportation crews on Thursday. A side road next to Provo canyon was allowing cars through as they cleared the area knowns as Slide Canyon. (Francisco Kjolseth | The Salt Lake Tribune) Heavy equipment crews work to clear Provo Canyon on Friday, Jan. 18, 2019, after an avalanche, which brought down as much as 30 feet of snow at mile marker 12 above Bridal Veil Falls on SR 189, was triggered by Utah Department of Transportation crews on Thursday. A side road next to Provo canyon was allowing cars through as they cleared the area knowns as Slide Canyon. (Francisco Kjolseth | The Salt Lake Tribune) Heavy equipment crews work to clear Provo Canyon on Friday, Jan. 18, 2019, after an avalanche, which brought down as much as 30 feet of snow at mile marker 12 above Bridal Veil Falls on SR 189, was triggered by Utah Department of Transportation crews on Thursday. A side road next to Provo canyon was allowing cars through as they cleared the area knowns as Slide Canyon. (Francisco Kjolseth | The Salt Lake Tribune) Heavy equipment crews work to clear Provo Canyon on Friday, Jan. 18, 2019, after an avalanche, which brought down as much as 30 feet of snow at mile marker 12 above Bridal Veil Falls on SR 189, was triggered by Utah Department of Transportation crews on Thursday. A side road next to Provo canyon was allowing cars through as they cleared the area knowns as Slide Canyon. (Francisco Kjolseth | The Salt Lake Tribune) Heavy equipment crews work to clear Provo Canyon on Friday, Jan. 18, 2019, after an avalanche, which brought down as much as 30 feet of snow at mile marker 12 above Bridal Veil Falls on SR 189, was triggered by Utah Department of Transportation crews on Thursday. A side road next to Provo canyon was allowing cars through as they cleared the area knowns as Slide Canyon. (Francisco Kjolseth | The Salt Lake Tribune) Heavy equipment crews work to clear Provo Canyon on Friday, Jan. 18, 2019, after an avalanche, which brought down as much as 30 feet of snow at mile marker 12 above Bridal Veil Falls on SR 189, was triggered by Utah Department of Transportation crews on Thursday. A side road next to Provo canyon was allowing cars through as they cleared the area knowns as Slide Canyon. (Francisco Kjolseth | The Salt Lake Tribune) Heavy equipment crews work to clear Provo Canyon on Friday, Jan. 18, 2019, after an avalanche, which brought down as much as 30 feet of snow at mile marker 12 above Bridal Veil Falls on SR 189, was triggered by Utah Department of Transportation crews on Thursday. A side road next to Provo canyon was allowing cars through as they cleared the area knowns as Slide Canyon. (Francisco Kjolseth | The Salt Lake Tribune) Heavy equipment crews work to clear Provo Canyon on Friday, Jan. 18, 2019, after an avalanche, which brought down as much as 30 feet of snow at mile marker 12 above Bridal Veil Falls on SR 189, was triggered by Utah Department of Transportation crews on Thursday. A side road next to Provo canyon was allowing cars through as they cleared the area knowns as Slide Canyon. (Francisco Kjolseth | The Salt Lake Tribune) Heavy equipment crews work to clear Provo Canyon on Friday, Jan. 18, 2019, after an avalanche, which brought down as much as 30 feet of snow at mile marker 12 above Bridal Veil Falls on SR 189, was triggered by Utah Department of Transportation crews on Thursday. A side road next to Provo canyon was allowing cars through as they cleared the area knowns as Slide Canyon. (Francisco Kjolseth | The Salt Lake Tribune) Heavy equipment crews work to clear Provo Canyon on Friday, Jan. 18, 2019, after an avalanche, which brought down as much as 30 feet of snow at mile marker 12 above Bridal Veil Falls on SR 189, was triggered by Utah Department of Transportation crews on Thursday. A side road next to Provo canyon was allowing cars through as they cleared the area knowns as Slide Canyon. (Francisco Kjolseth | The Salt Lake Tribune) Heavy equipment crews work to clear Provo Canyon on Friday, Jan. 18, 2019, after an avalanche, which brought down as much as 30 feet of snow at mile marker 12 above Bridal Veil Falls on SR 189, was triggered by Utah Department of Transportation crews on Thursday. A side road next to Provo canyon was allowing cars through as they cleared the area knowns as Slide Canyon. (Francisco Kjolseth | The Salt Lake Tribune) Heavy equipment crews work to clear Provo Canyon on Friday, Jan. 18, 2019, after an avalanche, which brought down as much as 30 feet of snow at mile marker 12 above Bridal Veil Falls on SR 189, was triggered by Utah Department of Transportation crews on Thursday. A side road next to Provo canyon was allowing cars through as they cleared the area knowns as Slide Canyon. (Francisco Kjolseth | The Salt Lake Tribune) Heavy equipment crews work to clear Provo Canyon on Friday, Jan. 18, 2019, after an avalanche, which brought down as much as 30 feet of snow at mile marker 12 above Bridal Veil Falls on SR 189, was triggered by Utah Department of Transportation crews on Thursday. A side road next to Provo canyon was allowing cars through as they cleared the area knowns as Slide Canyon. (Francisco Kjolseth | The Salt Lake Tribune) Heavy equipment crews work to clear Provo Canyon on Friday, Jan. 18, 2019, after an avalanche, which brought down as much as 30 feet of snow at mile marker 12 above Bridal Veil Falls on SR 189, was triggered by Utah Department of Transportation crews on Thursday. A side road next to Provo canyon was allowing cars through as they cleared the area knowns as Slide Canyon. (Francisco Kjolseth | The Salt Lake Tribune) Heavy equipment crews work to clear Provo Canyon on Friday, Jan. 18, 2019, after an avalanche, which brought down as much as 30 feet of snow at mile marker 12 above Bridal Veil Falls on SR 189, was triggered by Utah Department of Transportation crews on Thursday. A side road next to Provo canyon was allowing cars through as they cleared the area knowns as Slide Canyon. (Francisco Kjolseth | The Salt Lake Tribune) Heavy equipment crews work to clear Provo Canyon on Friday, Jan. 18, 2019, after an avalanche, which brought down as much as 30 feet of snow at mile marker 12 above Bridal Veil Falls on SR 189, was triggered by Utah Department of Transportation crews on Thursday. A side road next to Provo canyon was allowing cars through as they cleared the area knowns as Slide Canyon. (Francisco Kjolseth | The Salt Lake Tribune) Heavy equipment crews work to clear Provo Canyon on Friday, Jan. 18, 2019, after an avalanche, which brought down as much as 30 feet of snow at mile marker 12 above Bridal Veil Falls on SR 189, was triggered by Utah Department of Transportation crews on Thursday. A side road next to Provo canyon was allowing cars through as they cleared the area knowns as Slide Canyon. 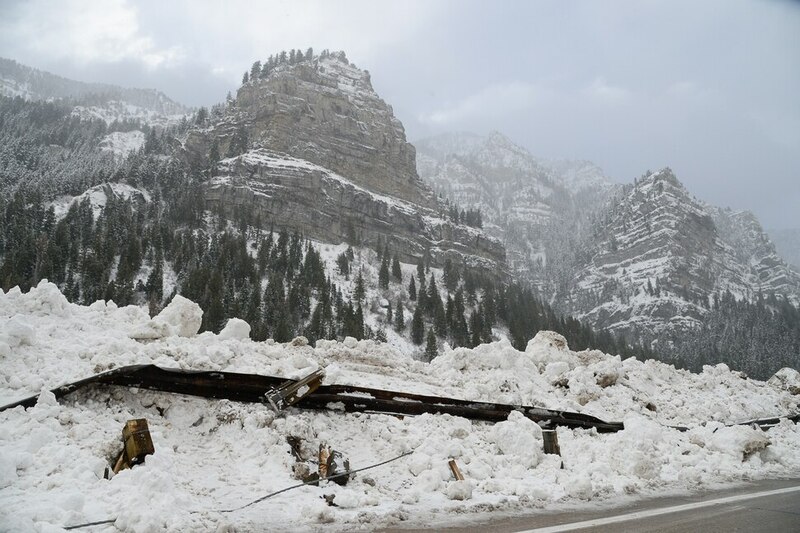 (Francisco Kjolseth | The Salt Lake Tribune) John Gleason with UDOT points out some of the damage as heavy equipment crews work to clear Provo Canyon on Friday, Jan. 18, 2019, after an avalanche, which brought down as much as 30 feet of snow at mile marker 12 above Bridal Veil Falls on SR 189, was triggered by Utah Department of Transportation crews on Thursday. A side road next to Provo canyon was allowing cars through as they cleared the area knowns as Slide Canyon. (Francisco Kjolseth | The Salt Lake Tribune) Heavy equipment crews work to clear Provo Canyon on Friday, Jan. 18, 2019, after an avalanche, which brought down as much as 30 feet of snow at mile marker 12 above Bridal Veil Falls on SR 189, was triggered by Utah Department of Transportation crews on Thursday. A side road next to Provo canyon was allowing cars through as they cleared the area knowns as Slide Canyon. 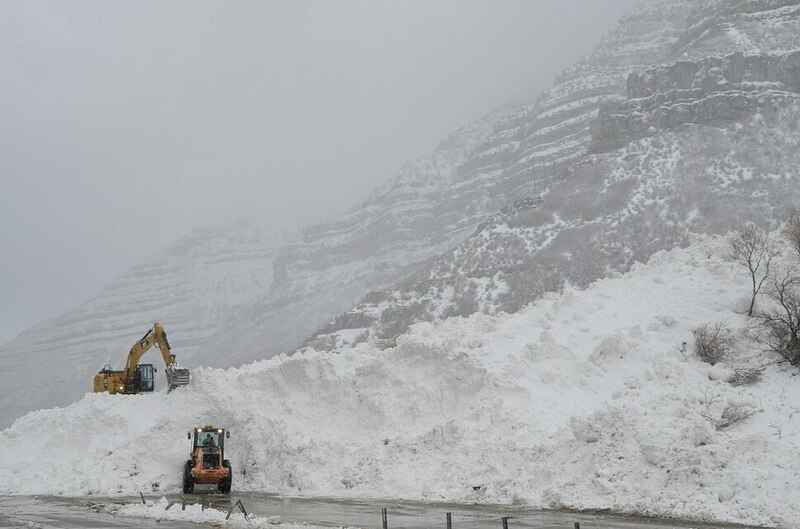 Crews continued to work to clear roads on Friday morning after an avalanche that blocked Provo Canyon and a rock slide that blocked American Fork Canyon, as rain and snow contributed to a number of traffic accidents along the Wasatch Front. SR 192 was re-opened through American Fork Canyon after a rock slide at mile marker 26 brought “several hundred-pound boulders” down onto the road Thursday night. 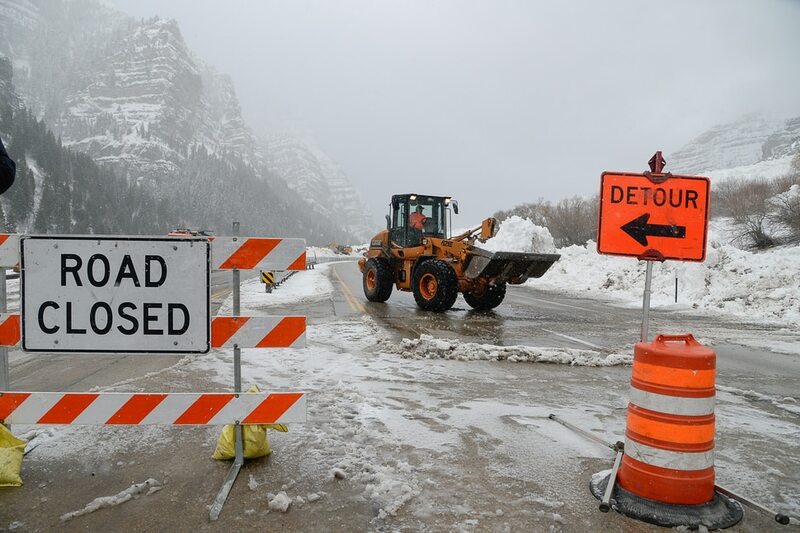 And Little Cottonwood Canyon was scheduled to remain closed until 10 a.m. Friday for avalanche mitigation, according to the Utah Department of Transportation. In Carbon County, schools were closed Friday because of the snow. A winter storm warning remains in effect along the Wasatch Front until 5 p.m. Friday, according to the National Weather Service, with additional show accumulations of 3-7 inches possible in the mountains and slippery and snow-packed roads. Accumulations of 1-4 inches are possible in the valleys, with more on the benches. The NWS recorded .76 inches of rain on Thursday at Salt Lake International Airport, a record for Jan 17. 🚨New daily precipitation record set at Salt Lake City Airport: 0.76" of rain. An avalanche warning remains in effect through Monday. According to the Utah Avalanche Center, the danger in the backcountry will be high, “with both natural and human-triggered avalanches likely” because heavy snow and strong winds will create dangerous conditions. Experts recommend avoiding steep slopes, though that warning does not apply to ski areas where avalanche hazard reductions measures are taken. Rain and snow showers will taper off Friday afternoon as the storm system exits off to the east, according to the NWS. A high-pressure system will produce a break in the weather on Saturday and Sunday with temperatures in the low- to mid-40s, but the next storm — which will bring colder temperatures and heavy snows in the mountains — is expected by Monday morning. There could be snow in the valleys during the Monday-morning commute.